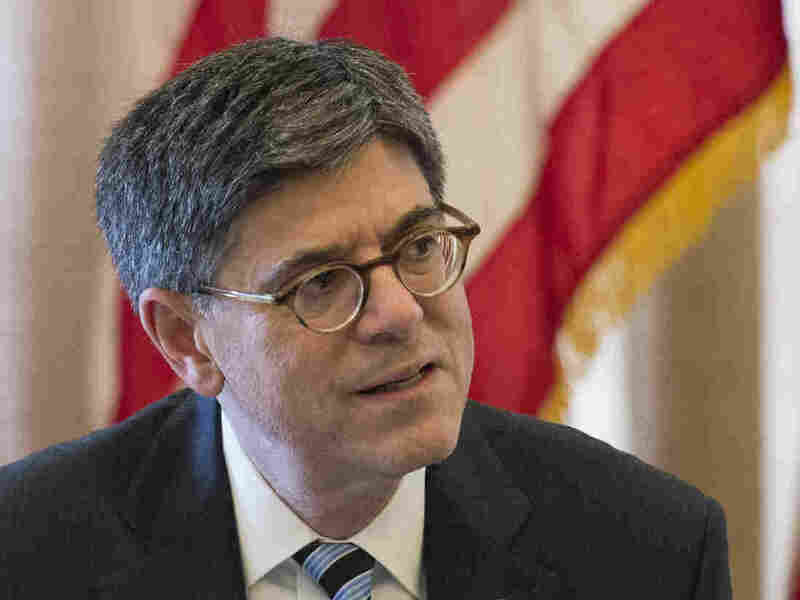 Treasury Secretary Lew On Global Trade Deals And Corporate Taxation Treasury Secretary Jack Lew says he isn't ready to write off embattled trade deals with Asia and Europe. But he says a better case needs to be made to U.S. workers who fear their effects. U.S. Treasury Jack Lew says a better case needs to be made to U.S. workers who fear the effects of proposed trade deals with Asia and Europe. Proposed trade deals with Asia and Europe have suffered setbacks recently. But Treasury Secretary Jack Lew says he isn't ready to write off the Trans-Pacific Partnership and the Transatlantic Trade and Investment Partnership. In an interview with NPR's Robert Siegel before Lew departs for a Group of 20 meeting in China, Lew acknowledged the anxiety among workers who have felt the impacts of the globalized economy but said the benefits of the trade deals need to be made "more clear." Lew also spoke about the U.S. budget deficit and the European Commission's finding that Apple owes $14.5 billion in taxes to Ireland. Robert Siegel: At this point, are the TPP and a proposed deal with Europe, the TTIP, dead? Jack Lew: No, there's a strong case for a good trade agreement, which TPP is, and we're going to continue to press forward as the president has indicated. We're going to continue to work with the Europeans. Whether we can finish it or not I can't guarantee, but we're gonna still try to get that done. But on TPP, where you've lost Secretary Clinton as a supporter it seems, do you read the opposition to that as just an election-year kerfuffle, or is there something changing in the way Americans see trade agreements, and in the way Washington had better negotiate trade agreements? I think that the benefits of market access for American workers are clear. I think what we need to be more clear at is how the benefits of trade agreements get to workers, how workers are equipped with the training they need to have the jobs in the new economy, how companies share the benefits of growth with workers. We have to make a stronger case, a better case, but the substance, the facts are clear. I'm not hearing you feeling the tectonic plates about trade policy shifting in the United States. I hear you feeling things haven't been presented exactly right, they could be sold better. I'm not hearing you detect some fundamental change on this issue. Look, what I believe is that there's a lot of anxiety and anger amongst working people around the world. It's not just in the U.S. We're seeing it in many, many parts of the world. I think that is a message to global financial policymakers that what we've been saying for a long time has to become central: That is how do we make sure that the benefits of a growing economy reach working people. It will not help working people to have a shrinking economy. Right now the United States economy would be doing better if global growth was stronger. That would mean more demand for U.S. goods and services. So we need a stronger global economy, but we also need to make sure the benefits are broadly shared. What would you tell an American who's anxious about the budget deficit and the debt and who sees the economy not strong enough for us to undertake either the spending cuts or the tax increases that might reduce the deficit and not strong enough to grow in a way that there'd be more revenues, and just watching the deficit grow? People have to focus on not just the nominal number of what the size of the deficit is, but the deficit as a share of the economy. When we came into office, it was roughly 10 percent of GDP. It's now under 3 percent of GDP. That is the most dramatic reduction in deficit in history. It's comparable with the post-World War II reduction. Isn't that share moving up a little bit right now? It has ticked up a little bit, but it's in the zone of a sustainable level and when, if you asked me today what is the most pressing need, it is more important to invest more in infrastructure and training today to build the economic foundation for growth that will throw off more income and more revenue in the future, then to get an incremental amount of deficit and debt reduction over the next few years. I want to ask you about Ireland, Apple and taxes. Why is the U.S. critical of the European Commission billing Apple for billions in taxes to pay Ireland? Aren't they trying to cope with global tax evasion, something which we think is a problem that should be handled? We have a shared view that companies should not be able to avoid taxation by shifting profits and by using loopholes in international tax laws. What's not appropriate is for, in the name of state aid, Europe to be rewriting tax law retroactively, reaching into a tax base that properly should be a U.S. tax base, because it's U.S. income, and doing it in a way that I think ultimately will hurt the business environment because it's going to create uncertainty in Europe. But in the case of Apple, it sounds odd. It sounds as if the U.S. is saying to Europe, how dare you do something about this, we're busy not doing something about this. It's our job not to do. I think that the process of working tax reform through Congress typically takes many years. It's not unusual for it to start in one administration and end in another. What's not appropriate is for Europe to preempt the ability for the U.S. to address that, which is what I've said is a potential outcome of the European action. Lew insists he's optimistic about the economy, although he says policymakers should pay attention to the global economic debates that have been so heated this year. He says more attention should be paid to spreading the benefits of trade, not reducing it. And he paints a glowing picture of an economic future that he says is possible. Lew: It will be a 21st century economy. It will have technology that's is different. It will have trade practices that are different. But we can have high standards that protect workers' rights, the environmental standards, good business practices and global markets that give U.S. workers and businesses the ability to get a fair share of the global markets. That's what we're fighting for. That sounds like a beautiful world. That sounds a far cry from the anxiety you've described of working people from all around the world. I don't disagree that the anxiety is there, but I also take optimism from the fact that there are policies to address that and if you look for example at the TPP, there are labor provisions in the TPP that are already driving an improvement in labor standards in countries like Vietnam and Mexico, and it is already having an impact to level the playing field and improve the ability for U.S. competition. What we can't do is pull away from the world. But what are the chances of the TPP being approved in the lame duck session of Congress? We are going to continue to press for it. We think the case is strong and the opportunity is there and we're determined to get it done.